A boxing, prison and court room drama, The Hurricane is based on the real-life of champion boxer Ruben Carter. 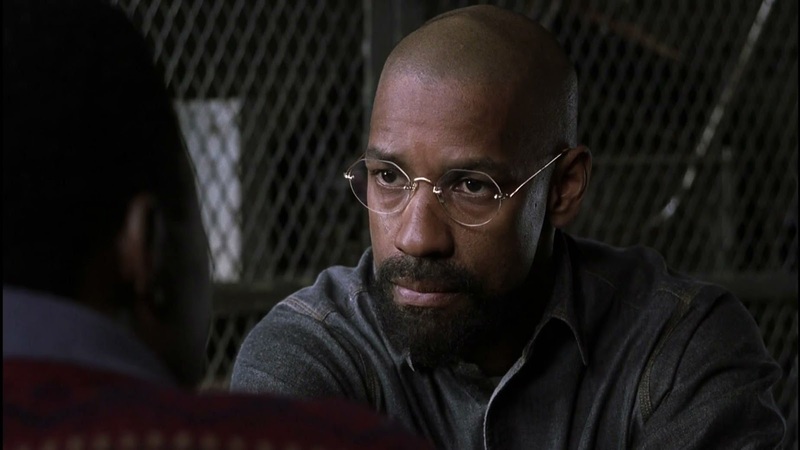 Thanks to a potent story, a committed central performance by Denzel Washington and agile directing by Normal Jewison, the film is a dominant viewing experience. It's the mid 1960s, and Ruben "The Hurricane" Carter is a top ranked middleweight boxer, having risen from a poor childhood including long stints in juvenile detention. With Hurricane at the peak of his abilities and fame, a triple murder is committed in a Paterson, New Jersey bar, with three patrons shot dead. Ruben and a friend happen to be in the area; they are arrested, convicted and sentenced to life in prison. Ruben insists that he is innocent and from his cell writes an autobiography. With Ruben incarcerated a parallel story features Lesra Martin (Vicellous Reon Shannon), a young black man from Brooklyn being raised by a foster family in Toronto. Lesra takes an interest in Ruben after reading his book, and communicates with the boxer first through letters then visits. Eventually Lesra's guardians decide to investigate Ruben's case, and relocate to New Jersey to agitate for a legal review of his conviction. Many other key characters from Hurricane's story also come to life. 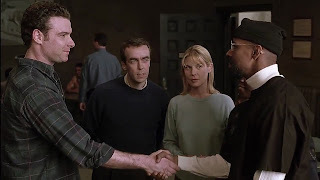 Featured prominently are Lesra's foster family Lisa Peters (Deborah Kara Unger), Sam Chaiton (Liev Schreiber) and Terry Swinton (John Hannah); Ruben's lifelong pursuer Detective Sargent Della Pesca (Dan Hedaya), Ruben's wife Mae Thelma (Debbi Morgan) and compassionate prison guard Jimmy Williams (Clancy Brown). Late in the film, David Paymer and Harris Yulin make important contributions as Ruben's long-term lawyers, while Rod Steiger has a short but memorable turn as a judge. Directed by Norman Jewison as an adaptation of Carter's autobiography and the book by Chaiton and Swinton, The Hurricane is a powerful story about the search for justice. Set partially in the world of boxing and mostly behind prison walls, the film is a carefully crafted experience, covering close to 20 years of Carter's life and charting his unwavering dignity in the face of larger forces of racism, conspiracy and discrimination. As with many biographical but non-documentary features, The Hurricane does portray Carter in the most favourable light, and his opponents come across as seething villains. The film rises above any such simplifications thanks to the intensity of its central performance. The Hurricane is quite possibly Denzel Washington's finest on-screen moment. He embodies the role and disappears into it, the actor leaving no trace as Ruben Carter comes to life, driven by rage, personal determination and quiet resistance. Whether in the ring or in prison, Washington is superb at finding the man smirking at a system that can defeat his body but never his soul, and expressing his emotions with a combination of lyricism and cutting critique. The film runs for 145 minutes, but does not feel long. Especially in the first half Jewison keeps the energy level high and jumps across time to capture various episodes from Carter's life. Snippets from childhood through to life in prison are presented out of sequence but nevertheless logically, to establish the full scope of Ruben's life experience. The second half settles down and is more focused on attempts to secure Hurricane's release, and the film finds a new but still compelling groove as an amateur detective story seeking to lift the lid off decades of deception. The Hurricane encapsulates rage in all its colours: a child's rage to survive, a boxer's rage to win, and a prisoner's rage to secure freedom. And it's the battles fought without weapons and boxing gloves that are ultimately most effective.